It’s easy to neglect one’s personal brand, or even the very idea of it. From childhood we are conditioned to dislike the idea of being self-promotional. Even our popular culture reflects the negative perception that we have about selling ourselves or being boastful. Movies like The Wolf of Wall Street, The Devil Wears Prada, or the modern classic, Jerry Maguire portray the dark “promote at all costs” perspective that most of us are repelled by. But nowhere does it say you have to create a personal brand that is distasteful or something you can’t be proud of. You have to remember that your personal brand already exists. People Google you when they are considering hiring you, or they look for references online when they are thinking about buying from you. If nothing exists, that can have as much of an impact as having the wrong information show up. Just like the clothes you wear, how you communicate, the ideas you share, and the things you create, your footprint in the world represents you regardless of what you think. I like to think of personal branding as a way to start communicating with people long before I meet them. When done right, it’s like having a friend make a personal introduction. Don’t you love it when that happens? Doing something to improve your personal brand is all about who you are and what you want to be known for. Whether you are a job seeker, a salesperson, or a manager looking to recruit, there’s so much to gain from telling the story from a human perspective, exactly like you want it to be told. 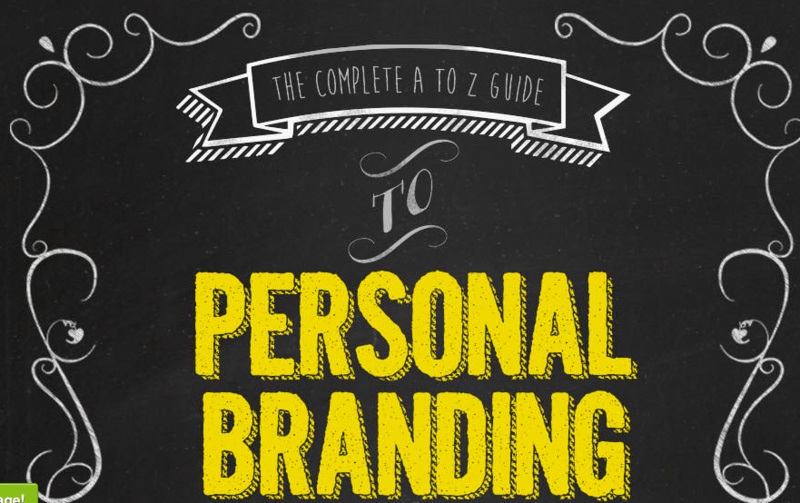 Before you dive into the A to Z Guide to Personal Branding, start with these six exercises. They’ll help you build a brand that represents who you are at your core — a brand you can be proud of. Make a list of the adjectives you want people to repeat after they meet you, talk to you, see or read about you. Are you: creative, relentless, indomitable, determined, insightful, scrupulous, thoughtful, or visionary? Then, narrow the list down to three. Ask other people: “What’s my special sauce? If you had to be a reference for me, what would you say?” Take notes of the answers you get. Make a list of at least five successful professionals that you follow and respect. Spend some time examining them. How are they alike? How are they different? What about their character intrigues you? Often what we admire is what we aspire to be. Pat Flynn, Rand Fishkin, Warren Buffet, Yves Béhar, Richard Branson, Seth Godin. I like these professionals because they think outside the box, and are intelligent, creative, irreverent, and honest connectors of ideas and people. Answer the question: “Who is the most important audience that my brand needs to speak to?” All the content you create and everything you say in the public domain will be discoverable online. By identifying and communicating with your most important audience, you’ll avoid any chance of personal brand misalignment with your larger goals. In fact, you’ll make sure your personal brand represents the values you and your audience hold. Ask yourself: “How does this make me feel?” When searching for your authentic voice, you have to continually check in with yourself to make sure you can emotionally live with your intellectual decisions. It’s so much easier to be motivated if we’re true to ourselves. You don’t have to pretend to be anyone that you’re not. In fact, I would adamantly advise against faking it at all. Everyone will find out eventually. Now, onto the A to Z Guide to Personal Branding: 26 tips that will help you solidify your credibility, expand your influence and grow your business beyond your wildest dreams. I’d love to hear about your personal branding experiences. What works best for you? You can comment below, send me an email or find me on Twitter at @sethstuff. Seth Price is director of sales and real estate marketing at Placester, a Cambridge, Mass.-based technology company specializing in building online marketing tools for the real estate industry. This post was originally posted on Placester.com.